Petsi Pies, a bakery beloved by College students and Cantabrigians alike, closed this week after 13 years at its 31 Putnam Ave. location. Darwin’s — a chain sandwich shop based in Cambridge — moved into Petsi’s old building Saturday. The Putnam Avenue bakery is the second Petsi Pies location to close in recent years. The first, on Cambridge Street, shut its doors in late August 2018. Steven and Isabel Darwin, the owners of Darwin’s, purchased 31 Putnam Ave. in 2012 and allowed Petsi, which had leased the first floor from the building’s previous owners, to keep using it. But Petsi owner Renee McLeod decided not to continue renting the space after January 2019, according to Petsi General Manager Jill Remby. The store’s Somerville location, on Beacon Street, is now Petsi’s only remaining branch. “It’s much more simple to run one store, and there’s lots of room to grow here,” Remby said in reference to the Somerville Petsi. In response to the vacancy left by the Putnam Avenue Petsi’s departure, Steven Darwin decided to open a fourth location of his local sandwich franchise. “The owner of Petsi Pies was not going to renew her lease, so this was going to stop being a Petsi Pies regardless,” Darwin’s employee Savannah Walsh said. 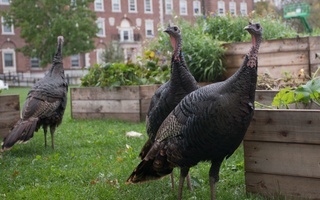 Petsi Pies was popular with Harvard undergraduates, especially those living in Mather House because of its proximity to their residence, students said. Austin D. Fuller ’21, a Mather House resident who said he frequented Petsi “about once a week,” said he was upset that the store had closed. “I’m a little disappointed, just because that was a study space for me that wasn’t the Mather Library, which can be a bit depressing if you go there too much,” Fuller said. Fuller also said the suddenness of the closing surprised him. “One day they announced it and the next it was closed,” he said. 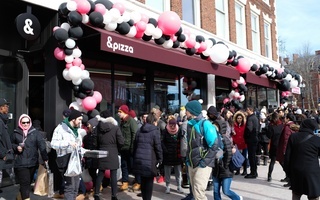 Though Petsi is no longer at the Putnam Avenue location, Walsh said Darwin’s still attracts some of the College students who had frequented the bakery. “We’re very popular with Harvard students because of our location,” she said. Though Petsi Pie fans may miss the bakery's offerings, patrons can still look forward to the cafe’s menu of savory sandwiches and coffees. A previous version of this article incorrectly stated that the Darwin's replacing Petsi Pies is the chain's third location. In fact, the new Darwin's is the chain's fourth location. Lecture. American Archeaology. Professor Putnam. Peabody Museum, 3.30 p. m. Open to the public.